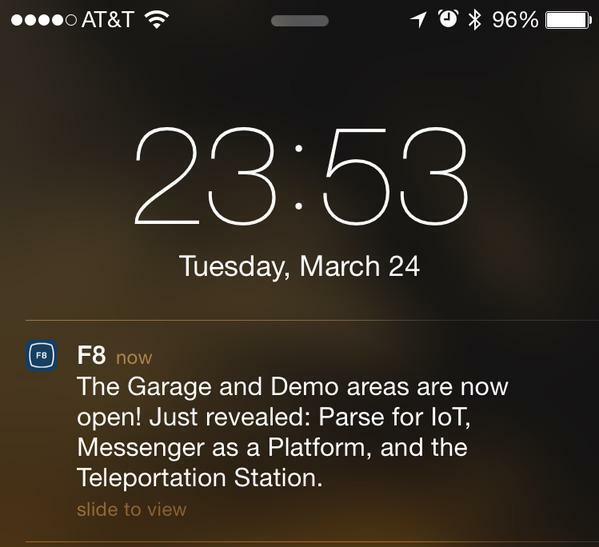 The alert seen by Multiple people seems to indicate that Facebook will reveal a version of its mobile app building suite Parse for “Internet Of Things” devices. It also appears to confirm our scoop from last week that Facebook will announce a Messenger platform at F8. We reached out to Facebook about the exact meaning of the notification, and the company has “nothing to add on this.” Pointedly, no denial or note that this is a hoax. Facebook previously said that all its major products would see announcements at F8, including Instagram, WhatsApp, and Oculus, along with Parse and Messenger. Judging by the notification’s text, it may have accidentally been sent early when it should have gone out mid-day tomorrow after the F8 keynote from 10am-11am PST when the major product announcements will be made. Last week, we reported that Facebook will be announcing at F8 that it plans to turn Messenger into a platform for other services, with an early focus on content. New sources say that Messenger and its platform will be one of the main concentrations of F8. But the Parse information is an interesting development we haven’t heard about yet. If this is actually an accidental but legit Facebook message, it points to the company yet again expanding its horizons to consider how and where it could enable communications between people beyond its core Facebook platform. The acquisition of Oculus VR (more on that below) was one sign of how Facebook has been looking to expand that idea to new platforms and devices. But Facebook’s contemplation of IoT is not new, with execs at the company wondering aloud back in 2013 about where Facebook’s social graph could fit into a wider network of connected objects. Parse, too, has been dabbling with the idea of IoT for a while, although not directly. You can see how and why this would make perfect sense and use of the Parse framework. And potentially, it could position Facebook to provide a development layer for the explosion of connected hardware that we are seeing these days. One thing we can think of is that Facebook is taking its Oculus VR activities up a notch, and inviting developers to come along on the journey. Facebook has been widely demonstrating the capabilities of the new Crescent Bay edition of the VR headhead over the last several months at different events. And given that today is actually the one-year anniversary of the acquisition, this could be a ripe moment to open up the platform to more input from developers. What do you think the stray F8 message is about? Let us know in the comments below.